This section is primarily based on the research originally conducted by Fredrik	Sööder, Martin	Nilsson, Jonas	Olevik, Joel Forsberg, Anton	Jacobsson, Linn Holm, Ida	Svensson, Caroline Uebel, Johan	Haglund and Oskar Ekman. A copy of this group's original report can be downloaded here. In Enköping, ideas of a visionary farmer triggered symbiotic developments and evolved into a local Industrial Symbiosis network. This network enables replacing fossil fuels with biomass based resources in the production of various energy products, adds value to local waste materials, and generates additional income streams for local farmers and forest owners. With its 24 000 inhabitants Enköping is described as the "closest city" in Sweden, due to its proximity to 38 cities that collectively host one third of Swedish population. The city is near lake Mälaren and is sorrounded by open areas and farmland. Enköping is also home to an industrial symbiosis network involving the city, municipally controlled services and local farmers and forest owners. Municipally owned combined heat and power plant delivers district heating to the the city and sources most of its fuel from willow localy grown by the farmers and from forest residues and wood chips sourced locally and from the region. The willow farmers, make use of effluents of the municipal wastewater treatment plant as well as sludge from private sewage systems to accelarate the growth of willow. Key actors of this network and their synergistic relations are depicted in the diagram below. Following video, produced by a group of Masters students from Linköping University, provides an overview of the industrial symbiosis network in Enköping. ENA Energi is a company owned by the municipality and operates the local power plant in Enköping. The power plant supplies electricity to the main grid as well as district heating to most of the residents and companies within the Enköping municipality.ENA Energi is involved in the symbiotic network within Enköping as the provider of district heating and as the end-user of local and regional biomass resources used as fuel. The plant has a capacity to produce 55 MW heat and 24 MW electricity and is primarily fueled by recycled wood chips from forest owners, and to lesser extents by forest industry wastes and by locally grown willow. The company also used to combust biogas produced in the municipal wastewater treatment plant, but this practice was stopped. However, the plant started to use raw biogas as fuel, which is sourced from a recently covered landfill site nearby. The size of this flow is not established since it’s just starting up. Currently, the ash from the boilers ends up in dumpsites in Västerås and Sala. It used to be mixed with the sludge and utilized as fertilizer by the willow farmers. There are five different plantations that are a part of the industrial symbiosis network. The plantations receive nutrient-rich effluents as fertilzer that would otherwise need to behandled by the wastewater treatment plant (WWTP). Among those, Nynäs Gård is of particular interest as sludge-water is sent directly from the WWTP whereas the other plantations receive sludge from private septic tanks and do not take the route via the WWTP. The sludge is hygienized in ponds for one year and, when ready, used for fertilizing the willow fields. The fertilizing sludge accelarates plant growth and shortens the harvesting time from four to three years. The municipality owned wastewater treatment plant (WWTP) receives 3.75 million m3 of raw wastewater from the city of Enköping annually. Part of treated effluents that are rich in nutrient content are used to irrigate the willow plantations in nearby farms, thereby accelerating plant growth. The anaerobic sludge digestor of the WWTP also produces biogas and a solid residue (digestate) also rich in nutrients. In the past the biogas used to be co-combusted in the CHP plant and the solid residues used to be used as fertilizer in the local willow field. However, these transactions no longer take place and instead the biogas is flared and sludge is landfilled. While technical . By the time of writing, the biogas was being flared and the sludge is landfilled. Reductions in greenhouse gas emissions: Having a district heating system and a CHP plant fueled almost exclusively by biomass resources enables substantial reductions in CO2 emissions - partly due to increased efficiency and partly due to the substitution of fossil fuels. Locally grown willow further contributes to lowering CO2 emissions by reducing the transort of biomass fuel. Phosphorus is a precious resource with limited availabilty. Nonetheless, every year large amounts leak out into the water system and are lost for future utilization. This leakage also causes significant environmental impacts through eutrophication and associated eco-system damage. By using sewage water as fertilizer more than 1 ton of phosphorus is recovered back into the cultivated system every year, which not only reduces eutrophication potential but also reduces the amount artificial fertilizer needed. In a similar fashion, use of nutrient rich effluents and sludge from wastewater treatment operations reduces both the uncontrolled release of nitrogen into the environment and the need for sysnthetic fertilizers. Through the use of effluents in willow plantations, the WWTP has reduced the nitrogen discharges by 30 t/year–corresponding to a 25% reduction. Cadmium is a hazardous heavy metals and therefore its presence in the agricultural land is tightly regulated. The special kind of willow crops used at the plantations absorbs cadmium well and therefore purifies the soil. This can lead to the de-contaminated of the land used for willow plantations, in time potentially making the suitable for growing food crops. The WWTP was in need to improve nitrogen removal, which required an investment of around 35 million SEK. By using the nutrient-rich effluents as irrigation water in willow plantations, the company was able to meet emission regulations only through an investment of around 15 million SEK (invested for the contruction of three natural ponds and the purchase of equipment for the spreading of effluents on land). Using sludge from private sewage systems as fertilizer provides further economic benefits, as their transport to the central WWTP is avoided. For the local farmers, growing willow is often as profitable as growing grains if not more. The largest cost of growing willow is to set the willow plant but in Sweden there are programs that offer financial aid for up to half of the investment cost. Another aspect improving the profitability of willow farming collective ownership of harvesting machinery by farmer organizations–representing another form of symbiosis–as well as the sale of the willow unharvested. In relation to ENA Energi, the size of the economic benefits depends on what assumptions that are made regarding which type of fuel the willow is replacing. However, assuming that the willow burnt in the CHP plant is offsetting pellets, ENA Energi reduces its cost for fuels by 2,5 MSEK/year. Stricter regulations regarding nitrogen discharges to the Baltic Sea–issued by the EU in 1991 and implemented in Swedish law in 1994–were a key driver for the WWTP to take action for reducing nitrogen discharges. The estimated cost for complying with regulations solely by implementing additional nitrogen extraction was deemed too high. The WWTP therefore went about examining alternative options. As part of such work, the municipality had a closer look at the sources of nitrogen and found that large quantities emerged from wastewater coming from private sewages. These quantities, transported by tanker from the more rural areas of the municipality, also contributed to more intermittent operational conditions in the WWTP. This intermittency lowered the plant efficiency, contributed to a rise in operational costs and added extra transportation. Such recognition was a key motivator for exploring alternatives with effluents emerging from private sewage systems, which resulted in their utilization in agriculture. Both ENA Energi and WWTP being owned by the municipality and sharing similar environmental understanding and objectives was also an important driver. Moreover, open communication and relaxed discussion climate among the local actors was an important aspect. Last, but not least, Swedish CO2 regulations and taxation system has played a significant role for the ENA Energi developing a CHP plant that primarily fuelled by biomass fuels. One main challenge in the cooperation between the WWTP and the Nynäs Gård farm was the question of how to divide investment and operational costs. Through a high level of responsiveness from both parts, an agreement that was aligned with their capabilities and made that satisfied both parties. This agreement stated that the WWTP was to bear the chunk of the investment costs while the farmer would give up some of his land for the sludge water dams and to manage the operation of the irrigation system. They also signed a contract, spanning over 15 years, ensuring that the farmer was obliged to receive the sludge water and ENA Energi had to purchase the willow, thus removing many uncertainties for the actors regarding this matter. As the symbiosis currently stands, ENA Energi does not derive any economic or environmental benefit from the use of locally grown willow as fuel. The willow is a more expensive fuel than the recycled wood chips, and come with many operational difficulties, such as increased soot, acidification in the boilers, and increased ash yields. Indeed, this is and has been a challenge for the symbiosis and ENA Energi has over the years decreased its input of willow in favor of the cheaper forest residues. This is also partly due to the change of corporate management, since the executives involved in the initial planning are no longer with the company. In fact using locally grown willow has important benefits, but they become visible when viewing the symbiosis as a broader system. If ENA Energi can be more beneficially included in the exchanges, they might be more inclined to evolve and expand the symbiosis. 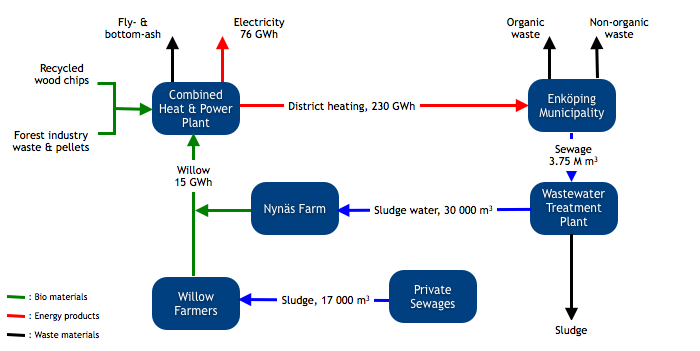 For instance, if they can resume the exchange of biogas with the WWTP, or if they can manage to use their ashes on the willow fields, ENA Energi might see the potential of the symbiosis more clearly. Another challenge that the actors had to face was the risk of generating bad press from discontent citizens in the process of spreading sludge water on farmlands. This was thwarted by being transparent towards the public, emphasizing the environmental benefits of the project and avoiding watering the area closest to the municipality with sludge water. There are various possibilities for further developing the symbiotic network in Enköping. Some of these are outlined below. Use of biogas from WWTP in the CHP: Currently, the WWTP is not delivering the biogas they produce to ENA Energi, due to technical difficulties. However, the WWTP is planning to expand their biogas production, by increasing their fermentation capabilities. If this expansion is realised, the biogas deliveries to ENA Energi will most likely resume. Improved extraction of biogas from the landfill: Today the CHP plant receives some raw biogas from a nearby landfill, this could be extended to include all of the methane that is produced there and the extraction could also be monitored more closely. This would reduce methane emissions from the landfill and reduce the amount of recycled wood chips to be used in the CHP plant. Utilization of fly ash: There are many secondary uses for fly ash including using it as a filler in construction sites, as road foundations, as a mineral filler in asphalt, and as the matrix within aggregate construction materials. This would be of interest to ENA Energi, as they are currently paying 800 SEK/ton to have the ashes disposed of in landfills. Utilization of bottom ash: The bottom ash was originally intended to be used as a fertiliser, by mixing it into the fermented dewatered sludge. Due to pollutants in the ashes, this hasn’t been realised. However, if the problem with the pollutants could be resolved, perhaps by altering the fuel mix, they could start utilizing the high levels of nutrients in the ashes once again. Extraction of phosphorus: ENA Energi is currently investigating the possibility to burn the leftover waste sludge and retrieve the phosphorus from the ashes. This would be a good way to benefit from the phosphorus in the sludge that has too high Zink content to be distributed on the willow fields. The technology to retrieve the phosphorus from the ashes might also make it possible to reduce the amount of bottom ashes that gets sent to the landfill. Utilization of sediment in sludge pools: The amount of sediment in the bottom of the sludge pools is increasing every year. This sediment is likely to have high nutrient content and therefore may have a high potential to be used on agricultural land. However, this option require further investigation of both the nutritional quality and the presence of pollutants (most notably heavy metals) that can render the sediment unusable.